Take a pan and heat 2 teaspoon of butter. Add onions and saute it for 2-3 minutes. Add spinach leaves, green chillies, salt, pepper and cook it till it becomes soft and water is burnt. Let is cool. Add guava paste (make small pieces of guava and blend it in the mixer-make sure that you remove the seeds, cut the centre part and use the side part ). Take bread slices and apply butter on one side of each slice. Take a slice of bread. 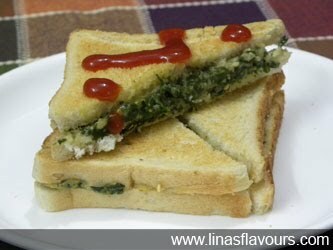 Apply spinach-guava mixture. Cover it with bread. Prepare all the sandwiches. Preheat oven, grill the sandwich for about 4-5 minutes, till it turns light brown. Instead of guava you can use banana also.